Hello all, it’s competition time again with our good friends at @Art_of_Football. 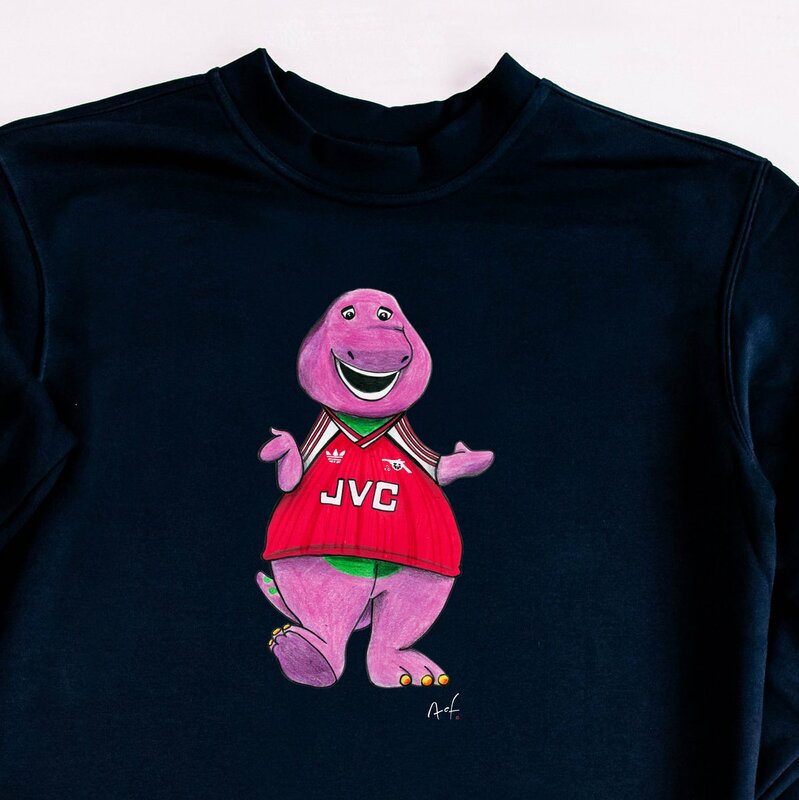 They have released a brand new design, Highburysaurus, as part of their alternative mascots collection and one lucky Goonerholic reader will get to win one. The quality of these tees and the packaging in which they arrive is superb. 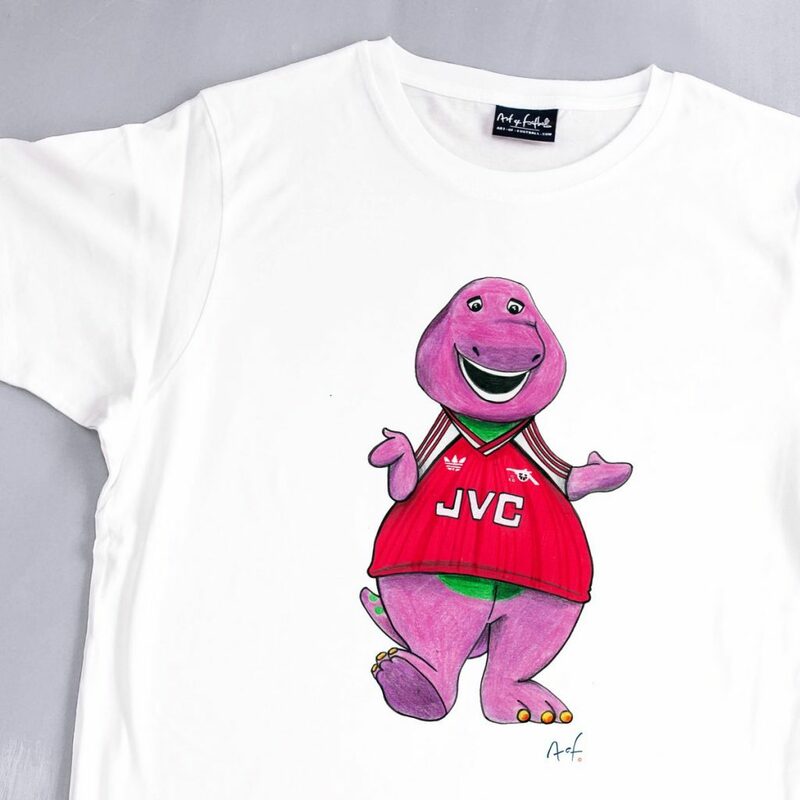 Check out the excellent Arsenal range on the Art of Football website . The tees come in a range of colours and sizes from small kids to XXXL for those of us of a fuller figure! Art of Football only produce a limited number of each design, so your teeshirts, like any good piece of art, are exclusive and completely original. That’s it. Get your entries in (just one per person please), and good luck to you. This teeshirt has me all over it. I’m not on twitter so I guess I’ll just have to buy one. But I don’t think this is one I’d forgive myself for missing out on! Top design and a top competition H. Well played. I just bought one. How could I possibly not? One remark to Vinay re the last drinks. Why do you think Nketiah has no future with us? He needs to play regularly and in my view has not been well handled by Emery. He is a very good striker and we would struggle to sign a better prospect without paying a big sum of money. We need to keep him but a loan may be the best policy next year . There is also one piece of interesting news through the Gooner which is circulating today that we have agreed a summer deal already for the Genk winger Trossard. He will cost about €20m and we have Nelson coming back and Saka and Amaechi coming through and an option on Suarez. first appear as the club mascot? I must admit I’d never heard of Trossard. No reason to count RVP as one of our home grown. Feyenoord home grown bought by Arsenal. Nketiah deserves his chance, as m’lud has testified. There is a possibility we have a ‘Class of 92’ of our own coming through which, given the financial constraints, would be timely to say the least. Riley definitely was one of the great class of 92, TTG, and I hope Josh and his pals are working on this aspect of developing a fine new crop with a pro-Arsenal tilt this time. They had better work fast before VAR takes complete control. Arsenal Ladies playing Man Utd in League Cup semi final tonight. Half time and we lead 1 nil. We will play Man city in the final if we win,after they beat Chelsea Ladies 2 nil in the other semi last night. ye heard of SUPERMALT ? result is the same as last year! Don’t know much about the Arsenal women, and haven’t seen them play on TV (and certainly not in person) but they beat Manchester United and that is plenty good enough for me. Well done, and quantiferous Kudos! !